Generally speaking the way men talk has become the norm at work. They got there before us, they set the accepted standards. We women had no input into how things evolved and ever since have been playing catch up. Most of what we accept as standard working practice has been around for some time, possibly since the Industrial Revolution and beyond. Standard working practice was devised by one gender alone. And if you are a woman, working in a world designed by men, within systems that suit men very well, where male ways of behaviour are the business norm and rewarded, then you are always at a disadvantage. You are always trying to make yourself fit, whether you’re aware of this on a daily basis or not. It’s still primarily a man’s world out there. The Times They are a’Changing! 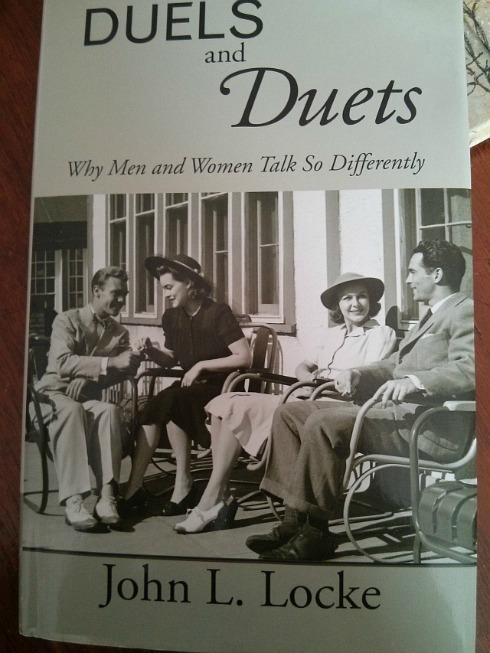 Until relatively recently, women who wanted to get ahead had to adopt the more traditional, male style of communicating. This is not good for us as we need to be happy in our skin, and to be true to ourselves. And we need to challenge the accepted view that the more aggressive male style (men dual, women duet) is best. There is room for both. Listen to talk in the office. You will rarely hear men preface a comment with ‘I’m sorry, but could I just say…’ I’m pretty sure you’ve heard women doing it or something similarly apologetic. It’s a habit and you can unlearn it. Think of it as managing your communication style to suit the circumstances, leaving extraneous words out and being clearer in your message. Dr Judith Baxter says this type of language is very common, even among senior women on major boards. An ‘over excessive apologetic style of speaking’. She found that women are four times more likely than men to use this type of self deprecating language and to speak indirectly, which disadvantages them. Another example is “I’m sorry to cut across you but...” She calls it ‘double voice discourse’, which makes women look less in control and less decisive when we’re not. We just talk differently. Try listening to yourself in the next meeting and make a note of any ‘talking tics’ you’d like change. There is much more helpful material and research like this in my Speak Up programme (audio and written) available in the shop at only £9.99 Download it now.